She was crowned Queen of the Jungle on Sunday night's final of I'm A Celebrity, Get Me Out Of Here!. And Georgia 'Toff' Toffolo still appeared overwhelmed with her win as she appeared on Good Morning Britain on Monday. 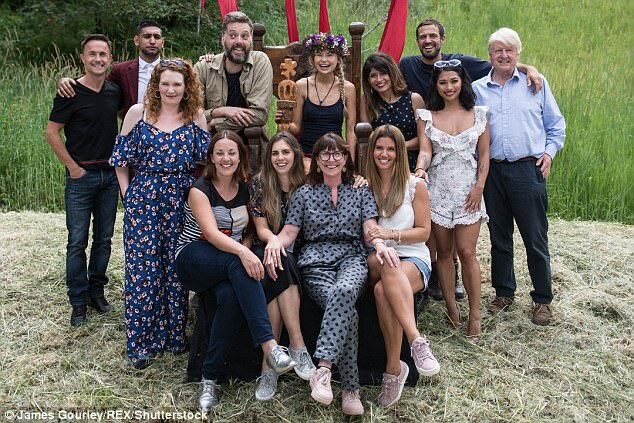 But despite her triumph, the 23-year-old Made In Chelsea star- who was the lowest paid celebrity in the jungle reportedly earning just £13k, admitted she didn't even pay rent before her stint, before casting doubt on reports she would cash in a reported £5M. 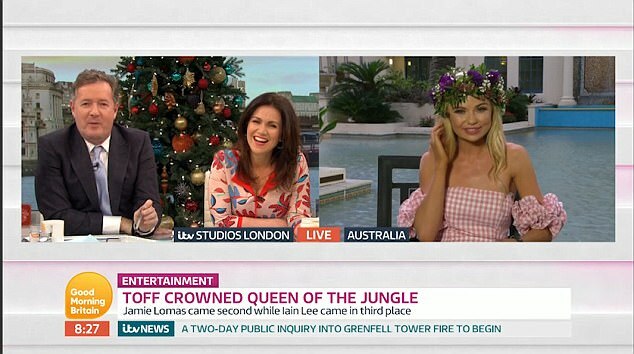 Toff, who won I'm A Celeb after receiving the majority of more than nine million votes cast - leaving actor Jamie Lomas in second place, also toyed with the idea of being set up with Piers Morgan's son- at his suggestion. Speaking to Susannah Reid and Piers from the Gold Coast, Toff admitted she was overwhelmed, before addressing rumours of her low fee compared to Amir Khan's reported £400,000. 'It's so funny, the first thing I said to my mum was that I didn't pay my rent', she said, before addressing rumours she will be raking in a massive sum, joking: 'I highly doubt it'. And the winner joked that she had her sights set on a job on Good Morning Britain now she's out of the jungle. Teasing his co-host, Piers replied: 'You know Toff, we could have a vacancy on this desk, absolutely no problem at all…'. 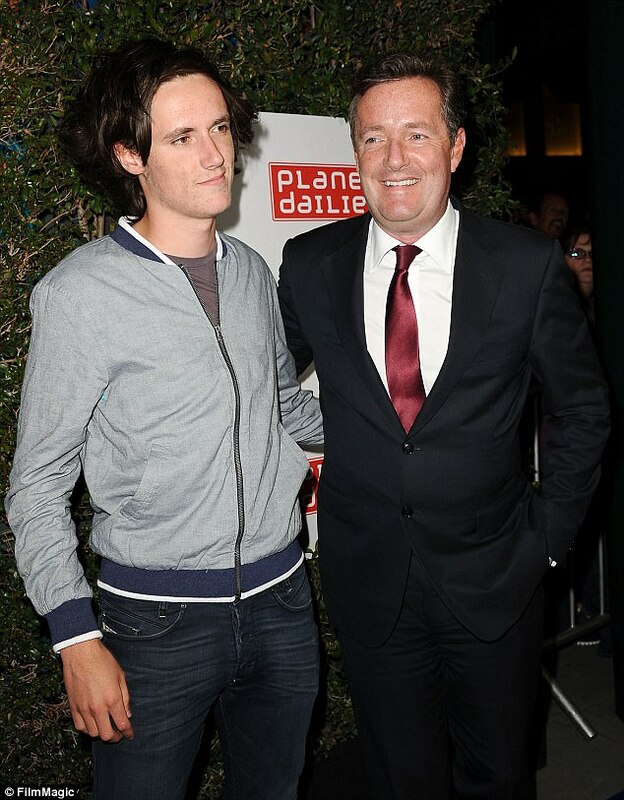 Later Piers tried to set Toff up with his son Spencer, who is a pal of the queen of the jungle. However the reality star may have to put work into a tryst with 24-year-old Spencer Morgan, after she admitted having to call him a few times before he picks up-with Piers admitting it's the same for him. 'I can't wait, I've to call your son a few times before he answers,' she laughed. 'Same as me', Piers agreed. Since her win on Sunday it has since been reported that Toff is set to make £5 million off the back of the show - with both ITV, who broadcast I'm A Celebrity, and Channel 4, who own Made In Chelsea, fighting over her to be their star. According to the Mirror, ITV2 are keen to give the reality star her own series, and even envisage the 23-year-old as a presenter for their channel next year. A source said: 'Georgia is in a enviable position now. She will be in the next series of Made In Chelsea, but beyond that there are lots of options and lots of interest. 'Channel 4 will be keen to keep Toff as one of their stars on E4 as she also recently appeared on their Celebs Go Dating series. So she will have some tough decisions to make in terms of TV, but the future looks very bright'. Triumph! 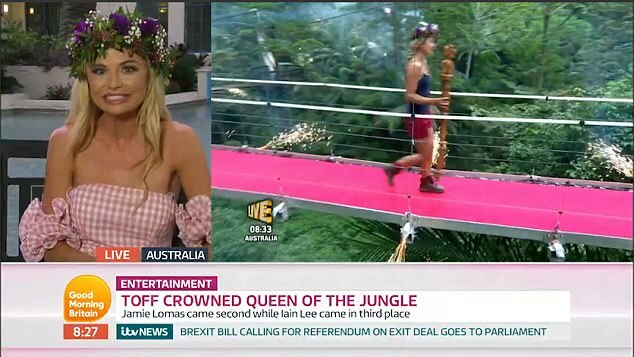 She was crowned Queen of the Jungle on Sunday night's final of I'm A Celebrity, Get Me Out Of Here! 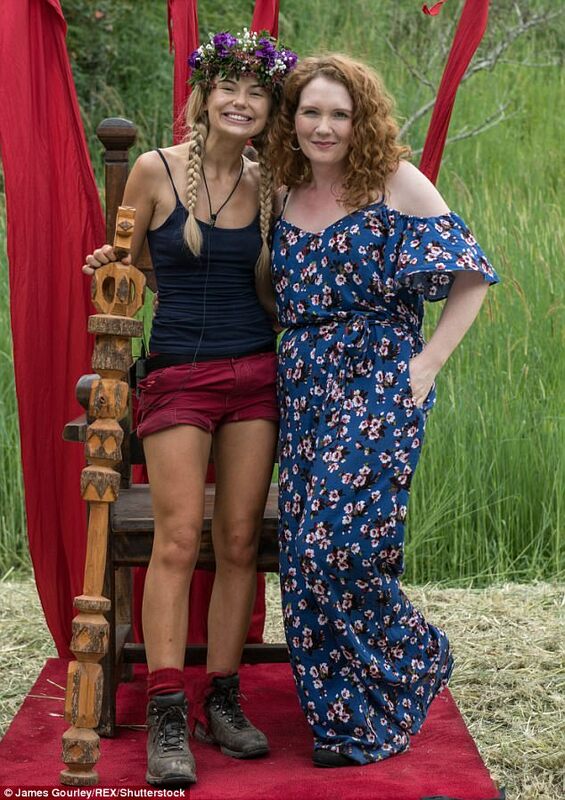 Toff proved to be the fan favourite - despite being the lowest paid contestant in the entire 2017 line-up. It was reported last week that she was paid just £13,000 for her stint in the jungle, while rival Amir Khan bagged a whopping £400,000. 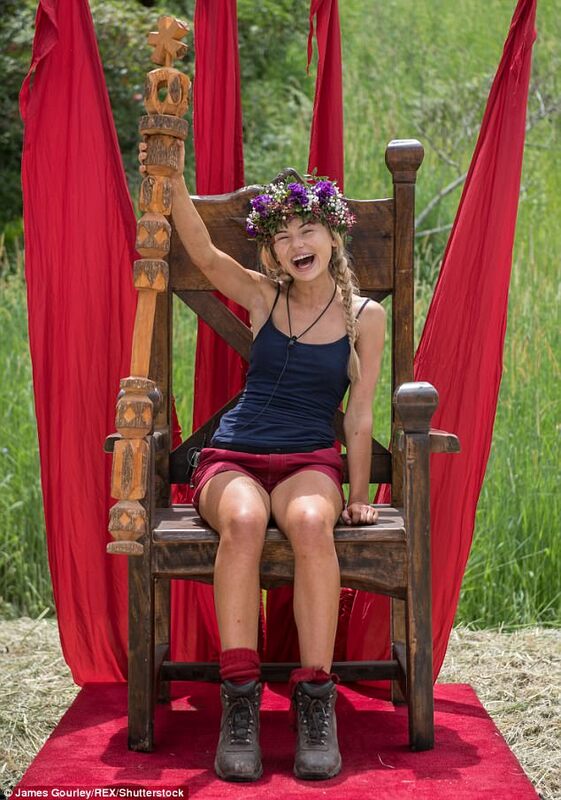 A source told The Sun: 'Georgia has been gold from the start of this series but ITV bosses have got her for a bargain price. 'She jumped at the chance to go into the jungle and producers didn't need to throw much money at her. Compare her to Amir's fee and they've got her for a snip. She later appeared on This Morning, joking: 'My face hurts from smiling. And the MIC star couldn't have predicted her popularity, adding: 'I thought everyone would thing I was this blonde airhead. And speaking about her relationship with Stanley, she continued: 'I really have this thing for middle-aged politicians and he is in the upper bracket of middle aged… It was love at first sight. 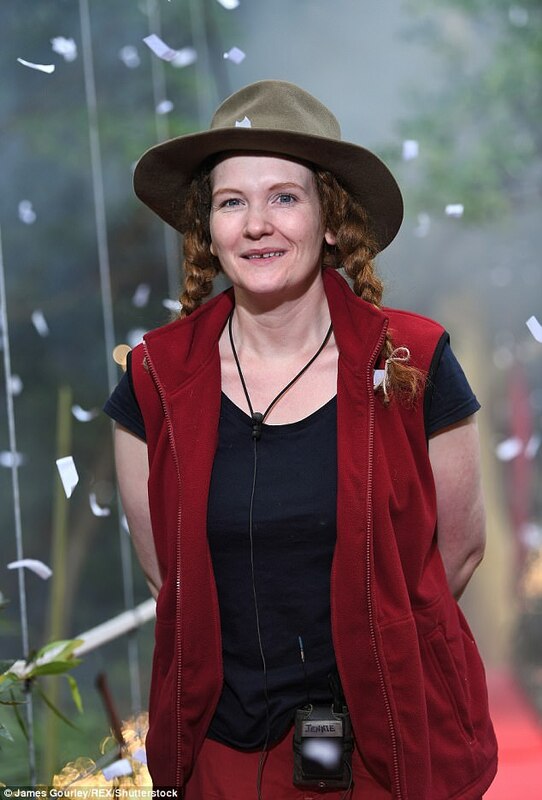 Meanwhile Jennie McAlpine also appeared on the show to talk about her experience in the jungle. 'It feel so nice and I've just seen everyone and they smell so good. Everyone is smelling each other's necks,' she laughed. Finally, the hilarious soap star likened being in the jungle to childbirth, laughing: 'They do not tell you the whole truth. It's like childbirth no one properly tells you exactly to expect, it’s a secret. ... It was talking to people for 23 hours a day without running out of things to say'.